Private villas built over the Caribbean in some of the cleanest and clearest water in the islands. The perfect place to enjoy nearby activities and still relax in the quiet Caribbean atmosphere at night. Our villas are eco-friendly with all self-sufficient utilities, without the sacrifice of comfort and luxury. An open floor plan gives great views of the bay and volcanic mountain range of Panama in the distance with spectacular sunsets. Over clean water perfect for swimming and snorkeling, daily shuttle to town, close to beaches. March 2019. Communication was excellent, immediate and accurate (despite the owner was in a different country with his wife having a baby), his immediate responses were very appreciated as it was our only initial way to communicate for the pick up. Boat service to and from rental was 10 minutes and flexible. Manager on site cooked us two very good meals (one was lobster and we watched the fisherman catch them out out bit and bring them in), the other was fresh tuna which we bought in town and he cooked for us. The prices were very reasonable for what you get. The rental is spacious, very comfortable, clean and loved the covered deck and hammock, this space has everything you need. We had access to paddle boards, and a two person kayak. The internet was in and out but you could locate a good spot near the window to send texts and emails. The linens were in good condition and enough for two people (we stayed 4 nights/5 days). The view is incredible. There is a reef literally right off the deck, we saw lots of small fish, a 4ft barracuda right off the deck, eagle rays each day and heard the monkeys in the forest behind us, bring your snorkelling gear well worth the extra luggage. We were very lucky that there was no one in the rentals on either side of us so we felt completely private. The accuracy of the rental is 5 star. Gorgeous location & clear water surrounds the villas. We stayed 4 nights in 2 of the villas (4 adults total) at the beginning of March 2019. We were lucky to stay while David & Kilga were managing the villas. They were fantastic hosts! There is a boat on premises for trips to town. The dock that Philip currently uses is very hard to find, especially when you are first arriving to Bocas with your luggage. My advice is to make certain you know where to meet that first time. The villas are not overly fancy, but if you are looking for a serene location to relax and especially snorkel, this is the place for you! We were very sad to leave and hope to return one day. David made our last night very special by preparing a meal for the 4 of us and delivering it to our deck! The sunsets at the villas are spectacular and we loved waking up seeing the mountains and cloud forest in the distance. We may have had a few hiccups at the beginning, but Phillip and David were extremely professional and made our stay wonderful. You need to buy into the fact that it is not the Beverly Hills Yacht Club. Perfect Getaway 4 a couple or family with kids if you are self-sufficient and enjoy a less touristy setting. 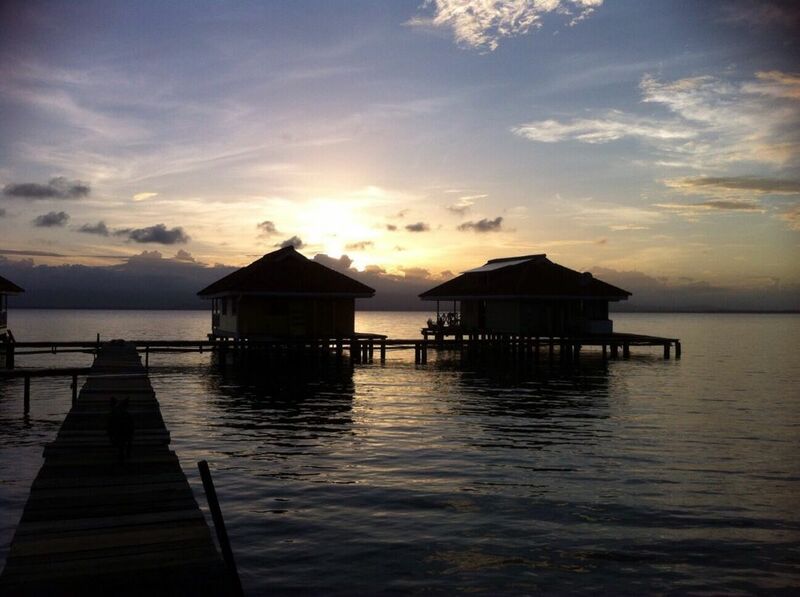 However if you enjoy the Freaky Friday party scene of Bocas town, you are only a 10-minute boat ride away. There were no surprises in the amenities and the property is represented accurately. We will be back! My wife and I stayed here for a week while on our honeymoon. The location is unreal, sunrises and sunsets were beautiful each day and the view of water and mountains was incredible. Great swimming/snorkeling/paddle boarding right off the back deck. The house is adequately furnished, with everything we needed in the kitchen, including a large water container which was filled by the hosts. Each room has a ceiling fan which kept us plenty comfortable for our stay. The WiFi was spotty, but honestly if you're looking to stay 'plugged in' while staying here, I think you're missing the point. The hosts were willing to ferry us to/from town once per day which was a real plus considering a water taxi can cost $20-40 dollars one way. As other reviews state, I would recommend bug spray which we found was good to have for sunset, otherwise the bugs were really not an issue. One thing to note is most water taxis (and the host) stop running their boats at sunset, which is about 6PM, which can make dinner plans in Bocas/Basti/etc. difficult. We ended up cooking breakfast and dinner at the cabin and explored the food options on each island for lunch each day. If you're looking for party-central, you're probably in the wrong place, but for a relaxing, secluded getaway, Bocas Villas was the perfect choice for us. My husband and I stayed in one of the villas for a week in February 2018. We spent most of our time reading, relaxing, and snorkeling. It was perfect. There is a coral reef about 3 feet off the deck that was absolutely beautiful. It was so wonderful to just jump in the water and start snorkeling. We saw so many beautiful fish, brittle stars, sea cucumbers, crabs, and many different species of coral. There was even bioluminescence at night--we went snorkeling once it was really dark and it was like swimming among the stars. A truly magical experience. Getting to Bocas town was really easy. Phillip and Ingrid are happy to schedule a ride and pick you up. The town has a great beach-town vibe. There a many restaurants and some really good food and drinks. There are some great shops with unique stuff. There are also several options for excursions. We went diving one day and that was fun (honestly we didn't see anything diving that we didn't see in front of our villa, but it was a shallow dive to be fair). There are several other excursions I would have loved to do. Truly something for everyone. The only downside to our stay was we did get pretty bit up by the local insects, but if you come prepared for that with mosquito netting (we started wearing lightweight mosquito suits at dusk) and some DEET it's well worth it. I cannot recommend this VRBO highly enough if you are looking to unplug and relax.